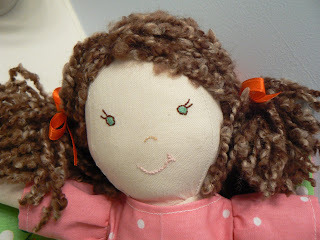 Crafty Little Beana: Here She Is! Okay I have finally figured out this pattern, I think. I am happy with the way she came out. I have really been wanting to make my own doll. 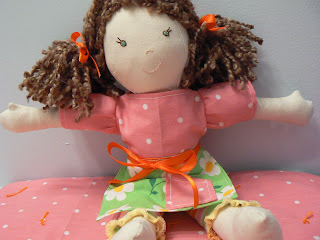 I have made many flat style dolls on my own, but this was my first of this kind. I need to tweak the pattern just a little bit more and then I think I have her as close to perfection as I can get. She is a playful little girl. Loves a good apron, with a pocket of course. Head stands are a must!!! So are stretchy rainbow leggings. Time for a rest on her favorite little knotted quilt. She is so cute! I may have a hard time sending her off to her new home (my swap partner). You were having a good time with that headstand picture, weren't you? Lovin' those leggings! You did a great job! She's oh, so cute! She's wonderful. I would have a hard time parting with her too! 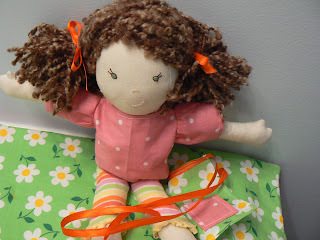 What a sweet doll- I am completely envious of people who can make dolls and gifts that involve more than a straight line of sewing! 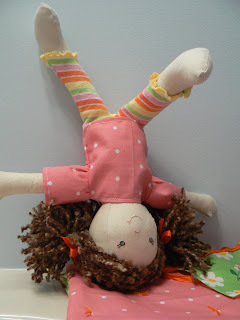 that is one talented doll. You have done an amazing job, she is beautiful.